The master API (kube-apiserver) is an instrument that provides read/write access to the cluster’s desired and current state. Components like the scheduler can use the master API to retrieve current state information, apply some logic and calculations, and update the API with new information about the desired state (like specifying to which node a new pod will be scheduled, or which pod should be moved to another node). In addition, cluster users and administrators can update the cluster state or view it through the Kubernetes dashboard, which is a UI that provides access to the API. CI/CD pipelines can also create new resources or modify existing ones using the API. 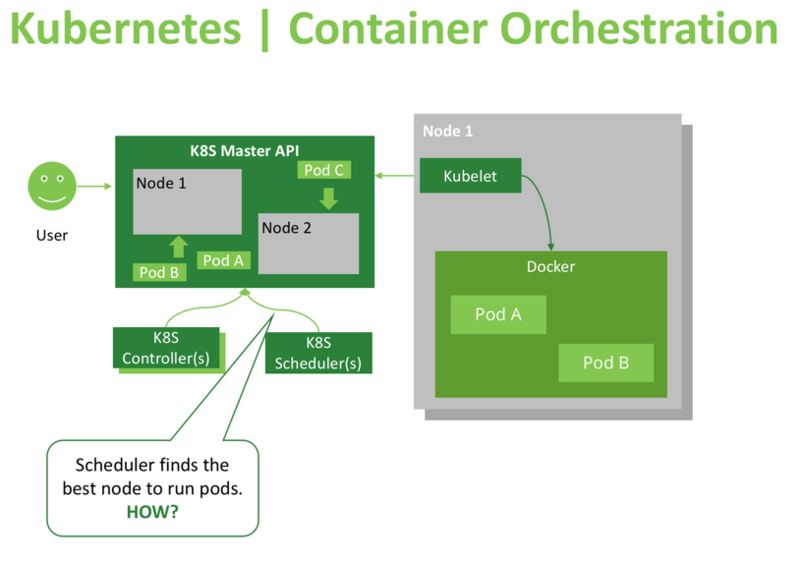 Other important consumers of the API are node agents named “kubelets,” which manage the container runtime (usually Docker) on worker nodes. When a Kubelet recognizes discrepancies between the reported desired state and the actual state of its host, it will run or terminate the needed containers to reach the target state described by the master API. Kubelets are frequently querying APIs, or watching them for changes, which is why Kubernetes’ response to updates and changes is almost immediate (a matter of seconds). As we can see, Kubernetes uses controller patterns to maintain and update cluster state, and the scheduler controller is solely responsible for pod scheduling decisions. 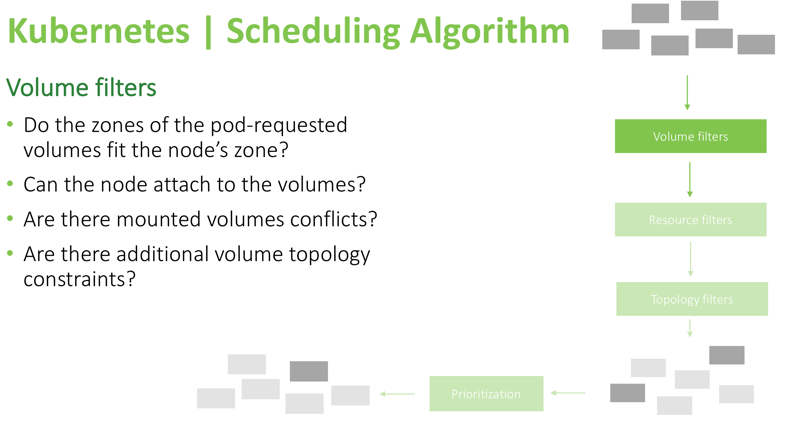 The scheduler constantly watches the Kubernetes API for unscheduled pods, and when such pods are found, makes a decision on which node the pods should be scheduled/placed. Using these checks, the scheduler knows in advance which nodes can’t run the pod, so it will remove those nodes from the list of possible targets. For example, is the data volume required by the pod in the same availability zone as the node? Can it be attached without conflicting with the underlying cloud provider rules? (In AWS, for example, it’s impossible to attach an EBS volume from one availability zone, to a node in another zone). Also, the volume topology constraints that were specified during volume definition need to be satisfied (a volume requested by a pod might have a “node-affinity” constraint that only allows it to attach to a specific set of nodes, or specifically prohibits it from attaching to some nodes). These filters above are pretty straightforward. The scheduler will check if the resources requested by the pod are available, ensure that there is no pressure on the node, like low memory or low disk space, and confirm whether requested ports can be opened on the node. For example, if the pod specified that it needs to bind to host port 8080, but another pod with similar requirements is already occupying that port on a worker node, the node will be removed from consideration and will not be a candidate to run that pod. 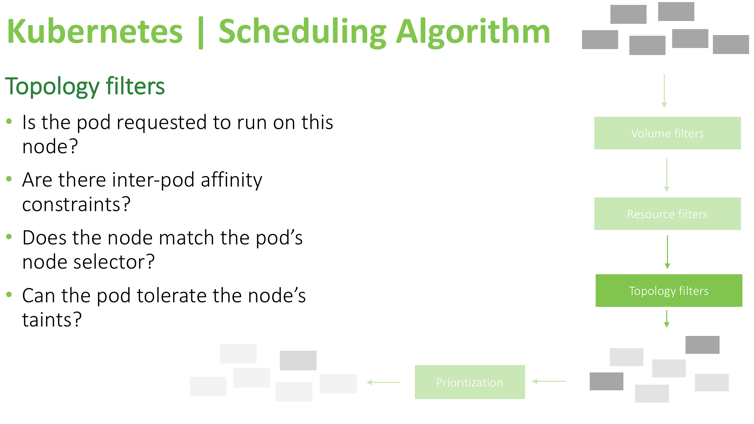 In this example, you can see that the scheduler verifies if the pod explicitly stated it needs to run on particular nodes or if it specifies pod-affinity (if it needs to run only when some other pods are present or avoid running on the same node with specific pods). Also, this filter checks to see if the pod can tolerate a node’s taints and node conditions like dedicated_gpu/maintenance/staging_only (an example of custom user-defined taints), or memory-pressure/unreachable/disk-pressure (an example of system-applied taints). Tolerations are specified in the pod definition and allow a pod to be scheduled on nodes with some specific taints. In other words, all other pods will be denied from scheduling or executing on a node, except the pods which explicitly state that they are allowed to run there. You can read more about taints and tolerations here. These are important mechanisms to fine-tune the scheduling behavior of Kubernetes. After this check is completed, the scheduler calculates a score for each node, and the highest scoring node will run that pod. 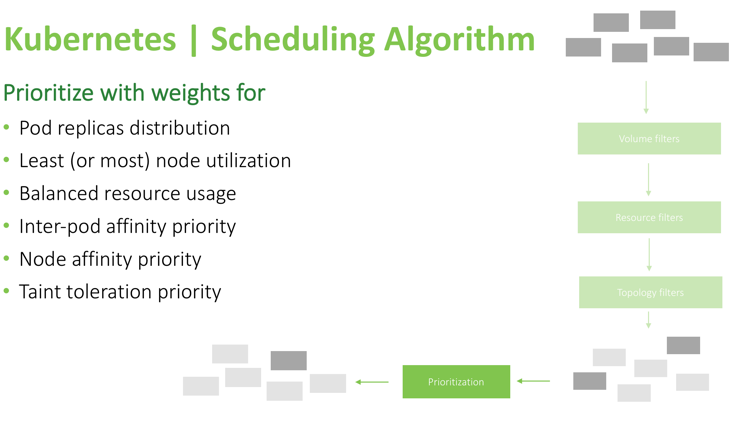 The first basic method to help the scheduler make the right decisions is setting memory/CPU requests and limits. Requests are used during the scheduling stage, and limits are used when the pod is already running (Limits determine the pod QOS level. You can read more about cluster rebalancing mechanisms and pod evictions in our in-depth article here). 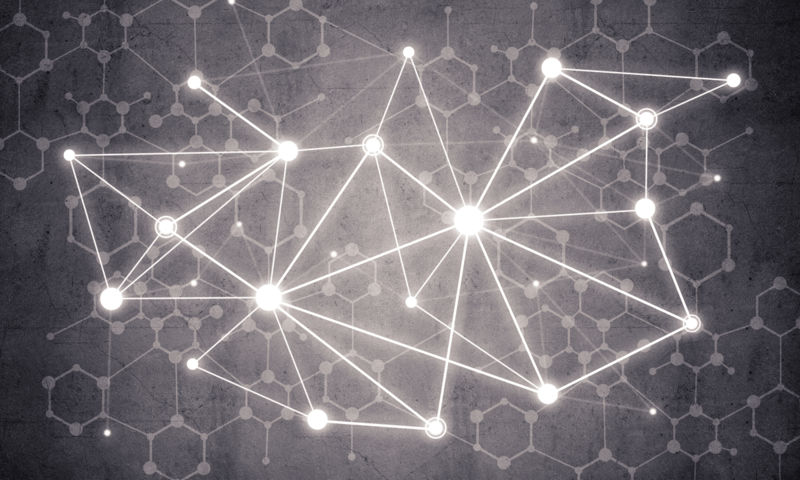 Make sure requested volumes are in the same availability zone as the desired nodes. For example, when you have a set of nodes in zone “A” where you want a pod to run, and a volume in zone “B” where you need to use that same pod, first make sure to clone those volumes into the correct zone where the needed nodes reside, or spin up a few new nodes in the zone where that special volume resides, so it can be attached to these nodes. Make sure the node didn’t reach its volume limit (for example in Azure cloud there is a limit of how many volumes can be attached). Do not specify volumes that are already attached to separate nodes. If a pod needs a few volumes but those are already exclusively attached to another host, that pod will fail to run because the condition of having both volumes mounted cannot be satisfied. Use volume topology constraints, by specifying a list of nodes where a volume can or cannot be attached. Directly set a nodeName where this pod should run. Use nodeSelector to specify labels that a node should possess to be able to run the pod. Taints (on the node) and tolerations (on pods) – As mentioned above, taints are indicators of node condition; no pods will be scheduled on a tainted node unless they specify “toleration” for that type of taint. A node can have multiple taints, and a pod can have multiple tolerations. When you use the “preferred during scheduling” option, Kubernetes will do its best to schedule the pods following that setting. If “required during scheduling” is used, it will force that condition and will not run the pod on a node unless that condition is satisfied. There are several different ways to specify the pod preferences for the nodes on which to run. A simple preference, familiar to many, is a “node selector” (specify particular label directly) that will cause that pod to be scheduled only on these nodes that have an exact label value. Another way of specifying node preference is by using node affinity with “node selector terms,” which allows usage of operators like those shown on the bottom part of the image below. This allows users to specify a flexible set of rules, based on which the decision to schedule or avoid scheduling will be made. 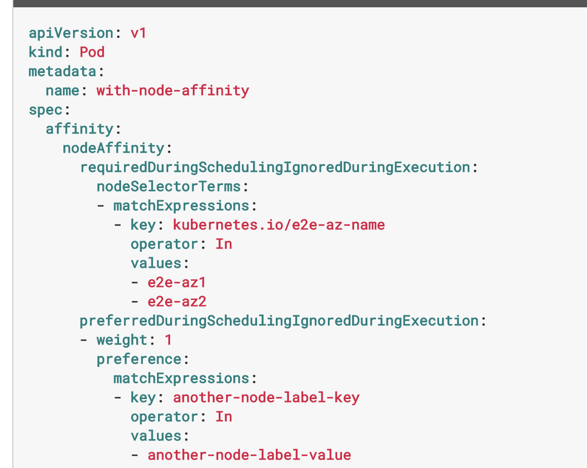 You can see, this set of rules requires a node to have the label “kubernetes.io/e2e-az-name” with a value indicating the availability zone as either “e2e-az1” or ”e2e-az2”. The rules also prefer a node that has the custom label “another-node-label-key” with the value of “another-node-label-value”, which means if a node exists that satisfies both constraints, it will be the most preferred candidate to run that pod. Using these rules, you can control the placement of pods beside each other. Some pods might accept being co-located with other types of pods, while others may need to avoid being placed onto the same machine with specific types of pods (like CPU intensive pods, which will cause bad performance for mission-critical workloads that Kubernetes might schedule on the same node). Pod “B” must be running on a node in order for this pod “A” to be scheduled there. Prefer a node where pod “B” is running, otherwise, run on any node. Prefer a node where pod “B” is not ruining, otherwise run on any node. Below is an additional example that introduces topologyKey, which is a label selector that will define that label key as “co-location indicator.” In order to distribute the pods evenly across the cluster, a scheduler will try to choose nodes with different values of the topologyKey label on these nodes. In order to “stack pods as close as possible with one another” (such scheduling preference also exists and is described in next step) it can base the decision on that topologyKey label again, this time preferring nodes which have the same label value. In addition to the described methods, there are other ways of modifying the behavior of the Kubernetes scheduler, such as setting a different scheduling algorithm using flags passed to the “kube-scheduler” component (which is one of the master components of Kubernetes that runs on master nodes). The two available options for the “–algorithm-provider” flag are: “DefaultProvider” and “ClusterAutoscalerProvider.” The “DefaultProvider” tries to distribute the pods across the cluster to evenly balance the load for all nodes. And the “ClusterAutoscalerProvider” will attempt to stack the most pods per node for better resource utilization (which is used usually when the underlying worker nodes are auto-scaled based on consumed resources like CPU and Memory). This allows you to pass a customized policy to the scheduler and is a very advanced feature documented only on GitHub (not even present in official documentation on the Kubernetes’ website). However, if hacking Kubernetes in-depth is your thing, you can find more information on the linked page on GitHub and read an example policy file here. Each available parameter for that policy determines the flow of the algorithm and the rules that lead to a decision about where the pod should be placed. It is described in this document. In order to put your policy in file, specify “–use-legacy-policy-config=true” + “–policy-config-file”. Otherwise, use the config map and config map namespace flags to specify the target config map to use as the policy. In the example above, the custom scheduler will need to fetch nodes and pods through specified APIs, then select pods with “phase=Pending” and “schedulerName=your-scheduler-name”. After calculating where it needs to place each pod, the scheduler will create a Binding object (for calculating the best fit target node you can use all information found in pod definitions and node definitions, like annotations, labels, Docker image names, volumes, or any information that can contribute to determining the right placement for the pod according to your requirements). 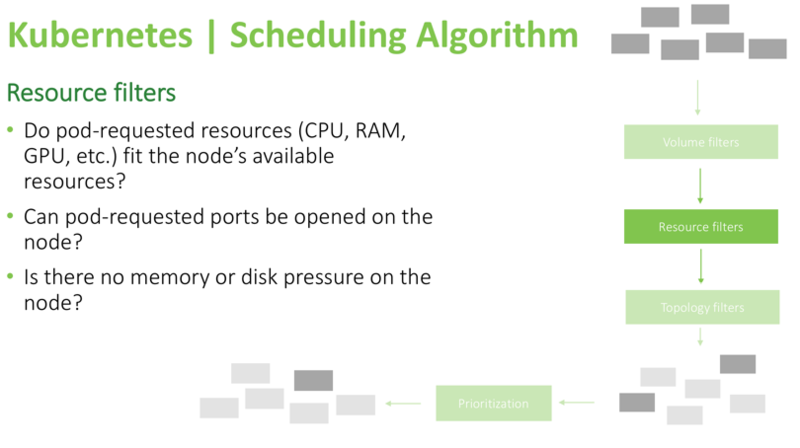 To better implement a custom scheduler you should watch the nodes and cache the information for faster calculation. A good starting point would be to fork the current scheduler, as it provides a good starting point for a custom additional logic and functions. We hope you found this post useful, feel free to ask questions in the comments below. 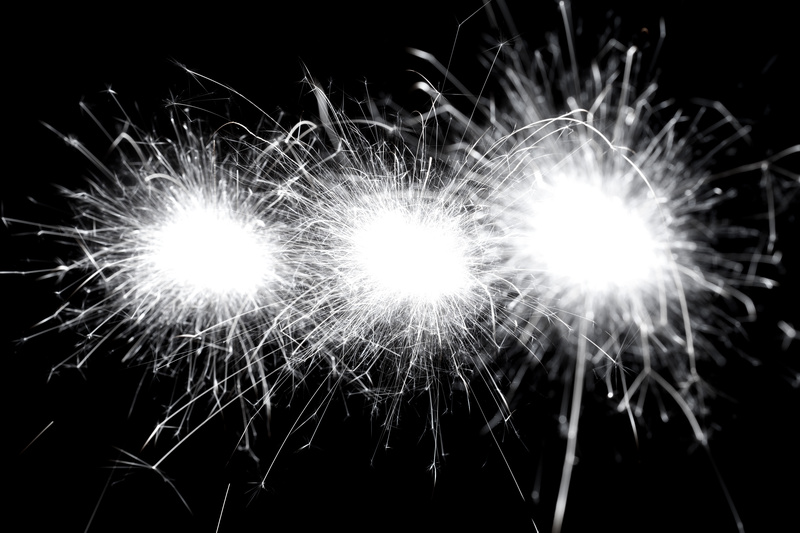 Our engineers will be more than happy to shed more light on the less obvious topics like custom scheduling policies or customized scheduler implementations.